When being a balanced rider, you have aids that can assist you. These include your right hand, left hand, right leg, and left leg. Today, I’m talking about these rider’s aids. Do you know which one of your aids is the weakest? Do you know which one of your aides you are over using? Last week, I talked about the rider’s aids and the rider’s willingness to use those aids. When you understand how to become effective using all four of these aids, you will become a more balanced rider. Today, we will be talking about using aids when riding in a circle because it requires more balance and more navigation on your part. [02:43] Picture yourself riding your horse in a circle to the left, but not in a round pen. [04:09] You have four choices of aids. The inside rein is the most common aid. The other would be the outside leg. [04:41] The two weakest are the outside rein and the inside leg. [06:17] We need to keep the bend to the right, but keep the horse going left. [08:33] You need to use a combination of aids. [09:07] Imagine riding the 50 foot circle, and the horse is bending to the inside just enough to shape it. Think about which aids you would be using a lot more or lot less. [10:06] Riders tend to use their inside rein a lot. 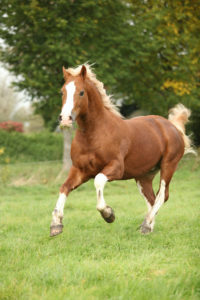 If you allow a bend change the outside rein becomes the inside rein. [11:03] The inside rein tends to be the strongest aid and the outside leg is the second strongest aid. Then the outside rein and the inside leg. [11:34] It can be really eye-opening to do this exercise. [12:05] One aid could be doing more than it should or be out of balance. [13:16] The training level of your horse also matters with how you are going to use your aids. [13:44] Even if the plan is to use both legs evenly, you still need to question whether you are doing it or not. [13:43] The awareness cycle is constantly happening. [14:08] It’s fascinating to double-check how in balance and aware you are of the four aids as you are using them. 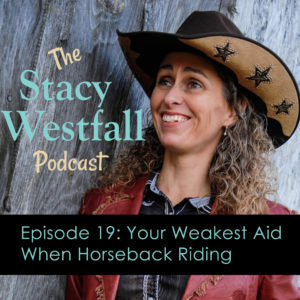 [15:02] If you do a lot of trail riding it’s difficult to figure out if you’re using one aid weaker or stronger, because it’s very common to switch the bend when you’re heading straight down the trail. [15:45] You don’t establish an inside leg and an outside rein when riding straight. [15:56] Find a flat spot and try the circle exercise. The weakest aid is usually the one your horses going out through. 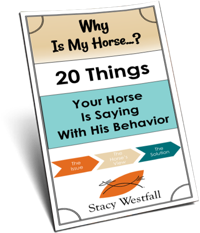 Sometimes horses point towards your weakest aid because they are taking advantage of it. [17:04] An advanced rider can ride a 50 foot circle, and then lighten an aid and see what happens. [18:00] In dressage terms we are looking for something called self carriage. Bridleless riding is also in this category. [18:37] Ride around and lighten each aid for a count of four and see what happens. 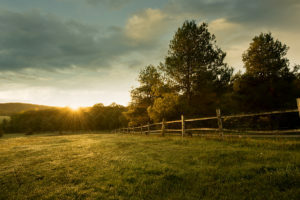 If you notice a big difference that may be the aid that you are overusing. The opposite one may be the weakest. All the spiraling in and spiraling out, and wondering circles you taught me years ago has really helped Hildy and I. If Hildy were to duck into the circle my first aids that I somewhat use together are my inside leg and outside rein with a slight hold on the inside rein to keep the bend. I really don’t think I use my outside leg too much. Lots of practicing the beginning maneuvers has helped a lot!! Yes it did! 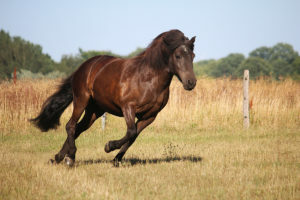 It is why you were able to jump to the neck reining exercise! You put down a great foundation. Thank you!! I learned from the best😊. I love your teaching style because it is easy to follow and you explain things so we’ll. You break down the manauves in steps that I understand and can comprehend and your examples are a tremendous help!!! I like how you explain the “why”. 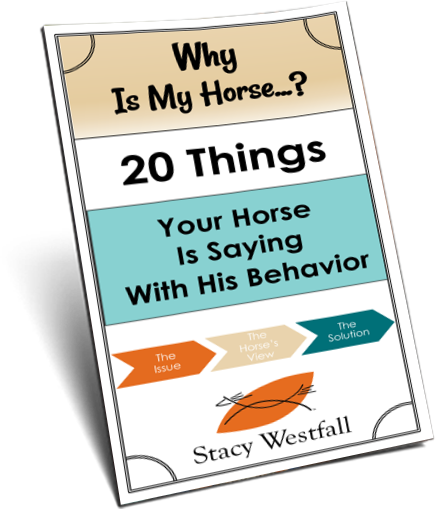 Interesting read about our strengths and weaknesses while riding a horse. I notice that with myself and how my left side is more dominant. When riding, I have to work harder to use my right side with as much strength as my left. Thank you for acknowledging an issue that all equestrians face. I am “competent” according to my trainer, but feel I am lower level intermediate. I found your explanation easy to follow and am looking forward to trying it out when the winds drop below 20 – 30 mph here in New England. Yay! Very good. The weather is finally getting nice here in Ohio and I keep sneaking outside to ride up and down the hills when the weather has a few good moments to offer. The wind does get strong every time these temps rise and fall. I’m not sure they are reaching your speeds though! It was a lot of information, but you did an amazing job explaining. Your analogies were excellent. I did have to really concentrate to get it all, and had to rewind twice, but I feel I have a very good understanding of the message you were conveying. I think your explanation is on the average riders level, which in my opinion is right where you want to be. Not too difficult for beginners, and not too easy for those more experienced. All should be able to gain something beneficial from your wise words. I’m glad I’m not the only one doing the motions! I was recording the podcast and bending to the left…my hands and legs moving while I was talking, lol!!! Thanks for the feedback! I’ll keep blasting out the info! Thank you again for sharing your knowledge and wisdom. I have been able to relate to every one of your podcasts. Good idea on getting off and walking. I do that too sometimes out on the trail. It always surprises the newer horses.